Home Editors pick SYL review Technology Fidgetly launches - Bluetooth Gaming "FIDGET SPINNER"
Fidgetly launches - Bluetooth Gaming "FIDGET SPINNER"
A company called Fidgetly, which describes itself as the "premiere fidget spinner company," is launching a Bluetooth-connected fidget spinner specifically designed for its new smartphone game. It's describing the product, called the FidgetlyCTRL, as the first-ever gaming fidget spinner. 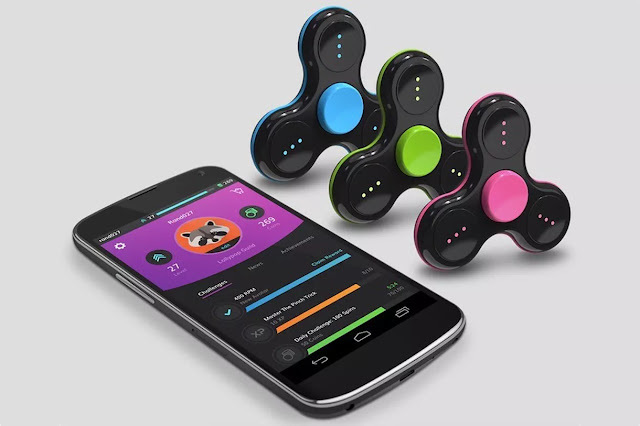 The idea is that you pair it with your phone, and Fidgetly's app will track users' "spinner stats," let them compete against friends, teach them tricks, and allow them to play games with the spinner used as a 360-degree motion controller. The company's CEO says in an email to The Verge that all these controls are enabled through the spinner's gyroscope and accelerometer. So in a game where you might tap your phone's screen to launch an attack, you could instead spin clockwise for an attack, or counter-clockwise for a different manuever, or spin the gadget while holding it at a specific angle to launch an attack across the screen diagonally. We haven't played with FidgetlyCTRL yet, but it certainly sounds intriguing. The device will cost $39.99 when it's released this fall through the company's website and at various retailers, like Best Buy, Target, and Brookstone. It's available to preorder today, however. Although Fidgetly is marketing this toy as a first-ever type of device, it consists of two ideas that already exist: virtual fidget spinner games and Bluetooth fidget spinners. Some of the Bluetooth spinners reportedly exploded while charging. That wasn't a great start for the industry. Obviously, Fidgetly is attempting to make its entire business revolve around fidget spinners, so hopefully their devices don't explode. The company says the spinner passed FCC and toy certification, and is powered by watch batteries, so it's safe to use. I'm going to go into this with a positive attitude. A company called Fidgetly, which describes itself as the "premiere fidget spinner company," is launching a Bluetooth-connected fidget spinner specifically designed for its new smartphone game. It's describing the product, called the FidgetlyCTRL, as the first-ever gaming fidget spinner. The idea is that you pair it with your phone, and Fidgetly's app will track users' "spinner stats," let them compete against friends, teach them tricks, and allow them to play games with the spinner used as a 360-degree motion controller. The company's CEO says in an email to The Verge that all these controls are enabled through the spinner's gyroscope and accelerometer. So in a game where you might tap your phone's screen to launch an attack, you could instead spin clockwise for an attack, or counter-clockwise for a different manuever, or spin the gadget while holding it at a specific angle to launch an attack across the screen diagonally. We haven't played with FidgetlyCTRL yet, but it certainly sounds intriguing. The device will cost $39.99 when it's released this fall through the company's website and at various retailers, like Best Buy, Target, and Brookstone. It's available to preorder today, however. Although Fidgetly is marketing this toy as a first-ever type of device, it consists of two ideas that already exist: virtual fidget spinner games and Bluetooth fidget spinners. Some of the Bluetooth spinners reportedly exploded while charging. That wasn't a great start for the industry. Obviously, Fidgetly is attempting to make its entire business revolve around fidget spinners, so hopefully their devices don't explode. The company says the spinner passed FCC and toy certification, and is powered by watch batteries, so it's safe to use. I'm going to go into this with a positive attitude.